Don't you hate it when you heat something up in the microwave and all the heat warmed the bowl so much you can't safely take it out of the micro? 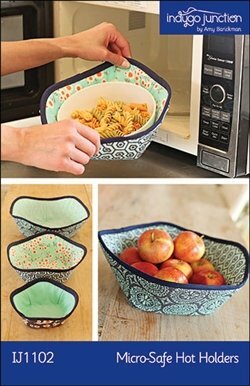 Cool bowls keep hands safe when removing items from your microwave. Three sizes provide a perfect fit for nearly all your kitchen dishes. Can also be used for decorative storage as well. Washable in 100% cotton. Diameters: Small:6-1/2in, Medium: 9-1/2in, Large: 12in. Let Angie help you whip up a few batches of these holders, perfect for gift giving!